This is the summary of consumer reviews for Memorex SingStand 2 Home Karaoke System - MKS-SS2. 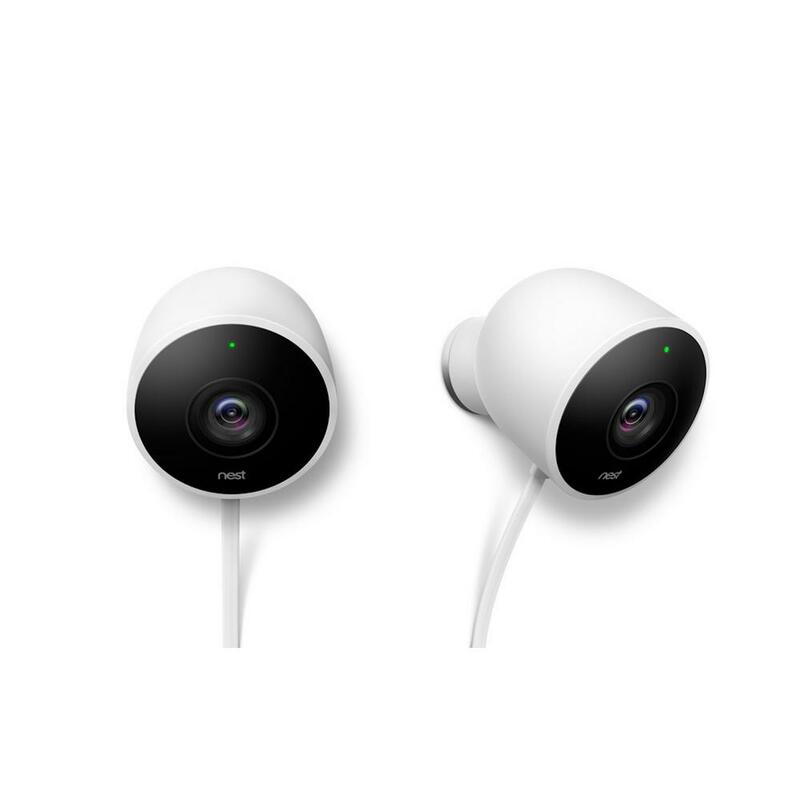 The BoolPool rating for this product is Very Good, with 4.40 stars, and the price range is $70.67-$99.95. The Memorex SingStand 2 Home Karaoke System - MKS-SS2 is an ideal product to have more fun at parties and family game nights. 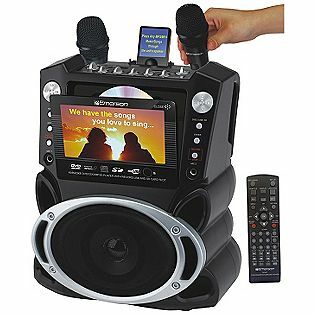 Kids and adults love to sing along to their favorite songs using this easy to use karaoke system. Just plug in your IPod or IPad and you can use the device instantaneously with your custom playlists. 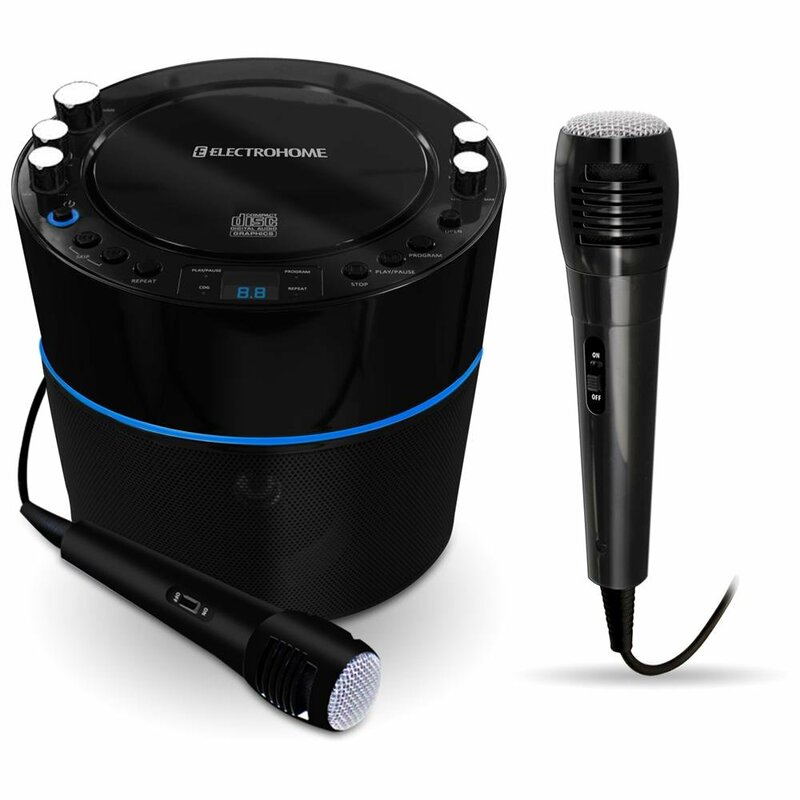 This Home Karaoke System comes with one microphone, and if ever you find a need for another one, you can always order extra microphone. The SingStand 2 also integrates a stereo speaker and a microphone, offering everything you need for a full karaoke experience. You can control the volume of the microphone or music separately. And with its instrument input, the system can even connect to a guitar or keyboard for easy musical accompaniment. Overall, the Memorex SingStand 2 Home Karaoke System - MKS-SS2 is a great success especially for children, highly recommended for those who have kids that love to sing. This product is sure to bring you and your family closer with a bit of musical bonding. I bought this for my 6 year old daughter because she loves to sing. We bought this singstand for our 11 year old daughter who loves to sing and she's absolutely thrilled with it. She really loves singing anyway, but this really lets her show off. we bought an extra mic so 2 can sing at once. It works amazingly, I bought the extra microphone to avoid the argument's and my kids can sing simultaneously with out over powering each other. Or even without music, kids can enjoy singing school songs they've learned. My kids love it and have no problems finding music to sing to. I'd also bought a spare microphone (Singing Machine model number 205). At first the kids were just singing into the machine while playing music in the background from a CD player and singing along with the vocals. 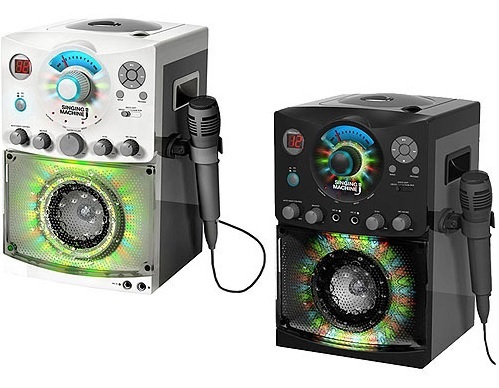 Loved the idea of a karaoke machine that'd work with an ipod/ipad rather than karaoke CDs alone. Our daughters and son really enjoy singing along with the iPod touch or iPad plugged into the mic. Sing and play guitar with pro mic. I really like this product but the mic was trashy, so I brought a new and no problem. When used in conjunction with a home theater audio system, it really works well. 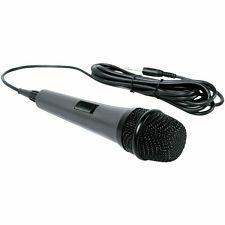 I bought a "NADY SP-4C Dynamic Microphone" with it, It even sounded better from the original mic that came with this product, so if you get two it'll be perfect. I wasn't very impressed with this product initially as the built in speaker really doesn't put out much volume. His voice aside (he's only 6.5), the sound is really pretty good, especially considering the price. And connect guitar with a wireless mic. 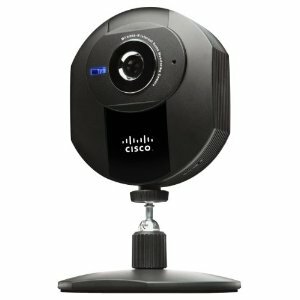 The feedback was screeching regardless of your positioning or speaker location?in other words, touch the mic, there was automatic feedback. We purchased a second mic and she and her friends take turns singing duets. the kids got new ipads for Christmas and these work perfect. The kids use this karaoke machine daily. I bought this for my kids for Christmas. Our kids (ages 7 & 4) enjoy singing everything from Christmas songs to Rock. Kids can;t get enough of it. The kids really like this thing. 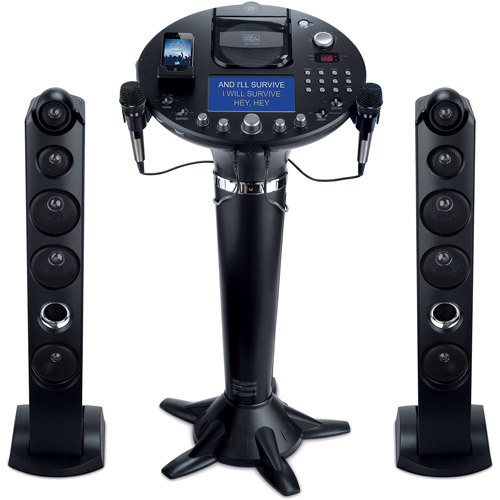 The sound quality and loudness are fine for a home karaoke system, and the design of it's great for kids. Every kid that comes over we've concerts!!. The quality is there, works flawless and all connections are solid, this gift was a big hit at Xmas time and the kids were at it non stop. You use your iphone, ipod, ipad or computer to play the songs. Very simple to connect your ipad or ipod. Use with your iPod or iPad music downloads. Works great with an iPad, iPhone, or iPod. 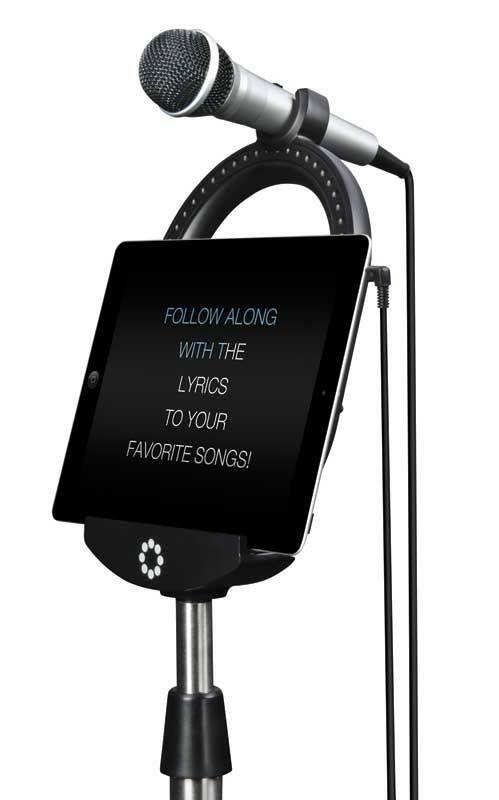 Pair this with the "Red karaoke" app on your iPad or iPod and you get 40,000+ songs with lyrics for $40 per yr. They hook up the iPods or iPad and sing. This one I connect up to my ipad and play already purchased songs from my itunes account. I downloaded several for free and searched for my daughters favorite songs on all of them. In the next model, I'd like to see a powered USB connection, so we don't have to keep charging the iPad and/ iPod. My kids use this with ease and can quickly/easily find their favorite songs. I think the machine is fine for kids to play with, but I don't recommend it for adults who want adequate sound quality and volume for their family room singalongs. we'd a lot of feedback at first but we figured out to turn down the volume control on the ipod and use the stand volume control instead and it cleared right up. Although not high powered, the amp and speakers are just about enough to output sound at a "comfortable" volume, although if you set the output volume of your attached device too high the resulting output level will be distorted. Other than that the sound is clear, volume is loud enough for my sister to enjoy her singing but not so loud I cant hear my tv in my room. At those volume settings I was getting speaker hum and distortion. I'd recommend setting the output volume just below the highest and then set the amp volume to high on the karaoke machine. It's made pretty sturdy, the volume controls allow you to to adjust the music and mic volumes separately. If you've a daughter or son that enjoys singing and performing then this's the machine for you! Anyhow in a nutshell, this machine serves its purpose for a couple of kids or adults to have some spontaneous fun. This'll take an non-distorted input signal and amplify it accordingly with little to no distortion.